อุปกรณ์วัด Multiparameter (pH/Conductivity/TDS Tester high range EC measurement) | All Test Kit by Higher Enterprises Co.,Ltd. 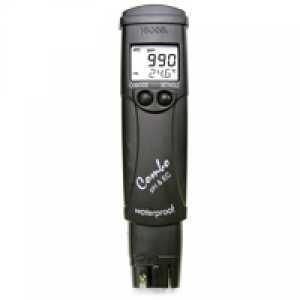 HI 98130 is a waterproof tester that offers high accuracy pH, EC/TDS and temperature measurements in a single tester! No more switching between meters for your routine measurements. This floating, waterproof combination tester has an easy to read, LCD and an automatic shut-off. pH and EC/TDS readings are automatically temperature compensated. The EC/TDS conversion factor is user selectable as well as the temperature compensation coefficient (β).